Freely Expand The Audio Interface of Your Laptop. Replace your failed 3.5mm jack and connect your headphones and microphone into your laptop at the same time for the ultimate audio recording setup. Just plug the USB audio adapter to your laptop, you can connect your headphone and microphone at the same time to enjoy two-way audio transmission. No drivers required and no complicated setup, just plug the adapter in. Compatible with Compatible with Windows, Mac and Linux and More. What are you waiting for? 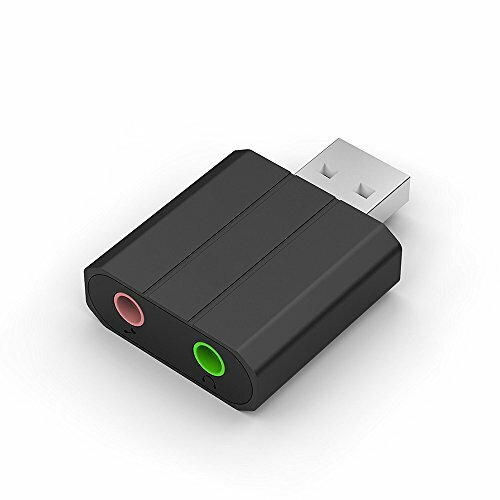 Just get this USB audio adapter and enjoy two-way audio in your gameplay. EXPAND AUDIO INTERFACE: Lots of laptops or ultrabooks only combine headphone and microphone into one 3.5mm audio jack. With the USB Audio Adapter, your traditional headset could still be used on your laptops.And you can enjoy 3D stereo audio. TWO AUDIO JACKS: Enable USB connectivity with your existing 3.5 mm audio headphones, headset, speakers, or microphone. Perfect to bypass a faulty sound card, audio port, or as a replacement for a broken USB audio adapter. PLEASE NOTE: This adapter only supports condenser mic, rather than dynamic mic. Mono Microphone requires a 3.5 TRS connector (not TS or TRRS). Please kindly check this info of your Mic before purchase. Thank you! COMPATIBILITY: No drivers needed. Fully Plug and Play. Compatible with almost all standard USB Audio Class enabled system including Windows 10/8.1/8/7/Vista/XP, Mac OS, Linux, Chrome OS and PS4, Surface 3 pro, Raspberry Pi. NOTE: Not compatible with PS3. Please setup our adapter as the default audio output (or input) device on your computer after hardware connection. PORTABILITY: With compact and lightweight design, the portable USB audio adapter only take a little space of your bag, you can take it anywhere without hassle.